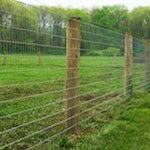 High tensile fence has become the most popular agricultural fence here in the East. Even though it is one of the more economical fences to install, it provides tremendous strength and durability and will give a lifetime of service. Because of the heavy posts driven into the ground to support the wire, high tensile fencing is not intended as a temporary fencing solution. It would be a daunting task for an animal to push their way through a high tensile fence by spreading the wires, so it works very effectively as a physiological barrier. But they can get through if they are determined enough. So adding two strands of electric wire provides an extremely secure fence. The electric wire also prevents cattle from constantly pushing against the wires and wearing them down. If you want a fence that is a physical barrier rather than just a psychological barrier, the woven wire is the best choice. It is truly impossible for large animals to go through a woven wire fence without first breaking it. 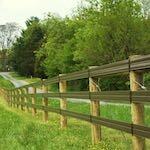 When shopping for high tensile fences here are a few important things to keep in mind. Check out our crew in the beginning stages of a high tensile fence installation below. Choosing the right post size is important. After more than 20 years of testing we have found that posts five to six inches in diameter deliver by far the most value. It is optimal for strength and is also the most attractive from a design standpoint. 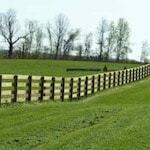 ProFence does not install any posts less than five inches and most of our posts are six inches or larger. The high tensile wire itself is engineered with tremendous strength. The innovation of this wire is that is has an unbelievable amount of elasticity when compared to the old barbed wire used in years gone by. So if an animal runs into the fence high tensile wire can stretch, safely slowing the animal down without damaging the fence. The strength and elasticity depends on the grade of the high tensile wire. 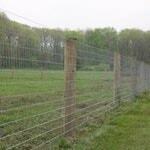 ProFence uses the highest grade of high tensile wire on all our fences as a standard. See specs here. High tensile fence can have a single wire or can be equipped with up to a dozen or more wires depending on needs. The post spacing is adjusted accordingly as well. 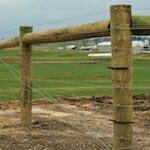 Less space between posts increases the strength of the fence; more space gives it greater flexibility. This ability to customize to fit a range of needs is one reason this type of fence is so popular. Although most commonly used for cattle fencing, a high tensile fence is also used for sheep, horses, bison, and other exotic animals. When it comes to horses it does have a high risk of injury. 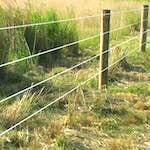 The wire puts a lot of strain on the posts so it is important to brace the ends or corners by placing two fence posts in the ground eight feet apart and four feet into the ground. A horizontal pole is then run between these two posts, reinforced by a diagonal wire that holds the brace system together. This forms a very strong corner that will not heave or be pulled by the constant strain of the wire against the posts. Minimum breaking strength: 1617 lbs.